2006 made in the USA frame--8"travel, DW-link downhill frame, 1.5 head tube, 150mm x 12mm thru axle hub spacing, 83 mm bottom bracket shell comes with a Manitou rear shock, newer bearings, paint job has usual chips and scratches ridden by a girl its entire life--great for someone 5'2" or taller, sadly, I'm barely 5'1". What you see is what you get. Buyer pays shipping. PayPal only. Thanks. Hey girl, my name is Rachel and I also live in Olympia and downhill race and such. I am trying to find more women in the Olympia area to ride downhill with. Have lots of friends who XC but no locals who DH. Just to let you know there is a shuttle ride every Sunday AM at 9 that leaves from Bike Tech. 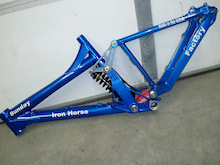 My email is mtnbikefun@yahoo.com. and my user name on Pinkbike is mtnbikechick.